The official explanation for a Turkish court once again banning citizens' access to YouTube over the weekend was the presence of new videos insulting the name of one of Turkey's founding fathers. But that video's been there awhile, and there could be another reason. Mustafa Kemal Ataturk is as genuine a hero to Turkey as George Washington is to America. Considered the father of his country, Ataturk laid the foundation for Turkey's metamorphosis away from the Ottoman Empire that was the focus of World War I, to an active component of a modern European Union. As a beloved figure in his country, defacing his name or his image is illegal there, under laws similar to those being considered in the US with regard to defacing the American flag. But Ataturk's heroic name may have been invoked out of convenience over the weekend, as a new YouTube controversy on an unrelated matter there was just beginning to rear its head. Once already last March, a Turkish court banned citizens' access to YouTube, after finding videos posted there apparently having defaced the founder's image. YouTube later pulled the offending videos, and the ban was lifted. But on Sunday, Turkish press sources reported and the Associated Press confirmed that the same court has re-issued the ban for apparently the same reason. This January 23 will be the one-year anniversary of the slaying of Hrant Dink, the editor of Agos Weekly and a champion of the cause of Armenians' rights in Turkey. Dink's death united Turkey in a way he would love to have seen in life, with newspapers all over the country denouncing his slaying, and soccer matches suddenly transforming into pro-Dink, pro-Armenian rallies. During his lifetime, Dink wrote and spoke out publicly against what he perceived as his government's continuing efforts to marginalize ethnic groups, including Armenians but also Turkish Greeks and Assyrians. He often invoked the darkest day in modern Turkish history, September 6, 1955, when rioting erupted, destroying some 8,000 Greek citizens' homes and businesses in Istanbul alone. 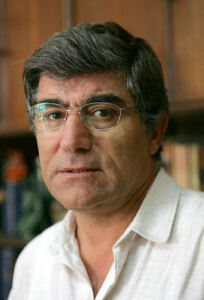 In an interview conducted seven days before his assassination, Dink suggested that the Turkish government may be manipulating census figures in order to maintain Armenians' minority status. "Turkey has not yet got accustomed to the thought that Armenia is an independent country in the Caucasus," Dink told Hetq Online. "There is a state, a neighbor, Turkey should comprehend this and start [a] relationship. When state policy fails public policy takes its place. There are some attempts to establish non-governmental relationship from two sides, but they are very weak, very few." The public outrage at Dink's death has galvanized skepticism against the Turkish government, who some believe may have been complicit, if indirectly. Evidence of that complicity was revealed in a video posted to YouTube, apparently taken by an amateur photographer, showing Dink's body lying untouched on the pavement for a very long period of time while police were otherwise occupied with the task of securing the crime scene. Accompanying the image is an original song whose lyrics, translated by one source into English, include the line, "If someone betrays his country, he will be taken care of immediately." Incidentally, a legendary story about Ataturk mentions how he refused to trample the flag of the defeated Greeks at the foot of a villa he once occupied, telling his officers that all symbols of their countries are to be treated as sacred, no matter their origin. Perhaps coincidentally, Turkish Internet users will not be able to see this particular video, especially if the ban continues through January 23.